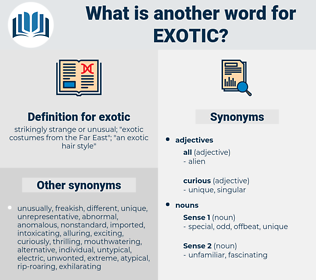 What is another word for exotic? strikingly strange or unusual; " exotic costumes from the Far East"; " an exotic hair style"
extraneous, invasive, bizarre, odd, tropical, unusual, extraordinary. standard, usual, normal, boring, dull, uninteresting, Familiar, regular. He ached to know everything, to see everything, to play with exotic systems in foreign countries. As regards the exotic distribution of the Indian species little need be said. ecstasy, EGTK, eighty-six, excise tax, east sea, East Sussex, esthetic, esthesis, equisetaceae, ectasis, eighties, exegetic, egoistic, ecstatic, ecdysis, estate tax, exodus, ectasia, esthesia, exostosis, eustachio, equetus, esthetics.